These past few weeks The Greek Crisis has been the topic of everyone’s conversations when you meet them. All the Greeks and Ex-Pats who live here on Crete are naturally concerned about all the changes Greece is facing and all the changes the Greek people must make to survive bankruptcy and who knows what else?! Obviously we are all hoping and praying that this crisis will not alter our lives too drastically. After all, it is so hard to imagine anything changing in our little part of the world. Here in Almyrida, which has always retained its quaint Greek charm, and in Plaka, a lively village just 2 kilometres further up the hill, everyone is happy and going about their businesses, ensuring that our little holiday resorts retain their relaxed and happy atmospheres. Basically we live a wonderfully simple life, largely without the trappings of wealth and yet one which is so rich in its quality. Sales of my unique Seashell Mosaics and Collages continue to be steady and for that I am extremely grateful. Also two new and privately owned ATM’s were installed in Almyrida this spring and these have been a real bonus for Almyrida’s shops, restaurants and businesses. Previously, the one and only ATM we had was always running out of money and over the last few years I have lost quite a few sales because of that!! Problem solved.. but another is on the horizon and when I recently popped into the shop where I buy the majority of my canvases, the worried owner advised me to clear his stock as he didn’t think he would be able to get hold of any more in the foreseeable future. I have a feeling this could become more commonplace with quite a few items we take for granted in Crete. On the social front it’s been quite eventful and was kicked off with the two wonderful weddings I attended in the same weekend! Both occasions surpassed my expectations and I had a thoroughly great time at them! 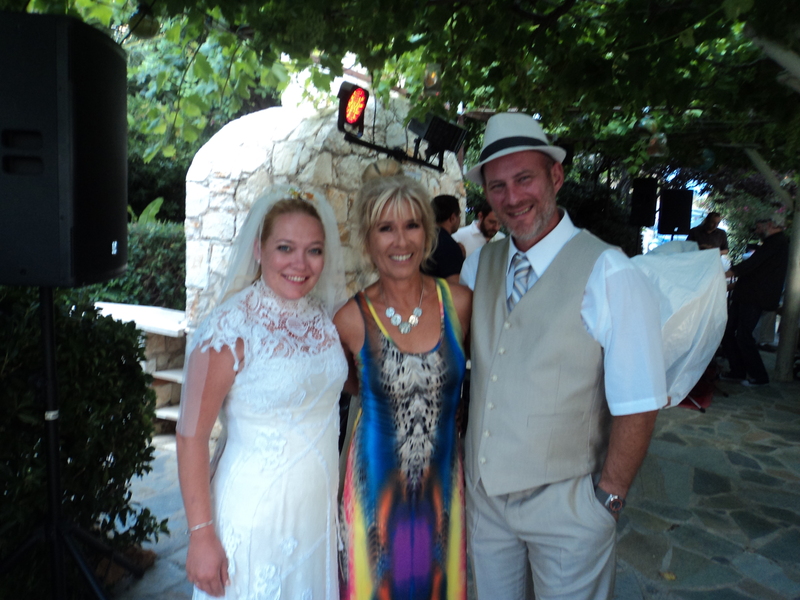 First was Alan and Sue’s wedding, held at a charming riverside taverna in Armenoi and set in the most beautiful grounds. Typically for this time of the year, it was a hot sunny day and after the blessing, which started at 5pm, everyone enjoyed exploring all the beautiful gardens before drinking and eating from tables set around a vast and fabulous green lawn. I told Nick that I couldn’t remember the last time I had walked on grass and that it reminded me of my very brief summer life in the UK! You don’t often see grassy lawns here on Crete as to keep one alive and healthy is costly and time-consuming. But boy did it pay off at this wedding! In the centre of this enormous lawn was a large circular decked dance floor, which was much used as no less than 4 separate bands were playing during the course of the evening. Alan is lead guitarist for the BacktraX Band and enjoyed playing a few tracks at his own wedding! The food and wine flowed freely well into the late hours of the night and it was just a great ‘Bash’! The following day, on the Saturday I attended Jeff and Shanna’s wedding, which was held at the Emerald Resort in Plaka. 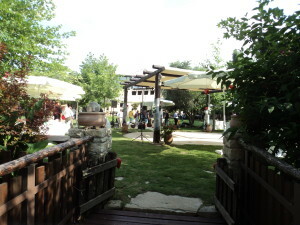 Only a few minutes’ walk from my apartment, this beautiful and quaint resort is another perfect venue for a wedding. But, in complete contrast to yesterday, the weather was cloudy and overcast and although still hot, thunderstorms were looming on the horizon! While Jeff and Shanna were reciting their vows at the beautiful poolside setting, the thunder started rumbling overhead and we all missed many of their words! Thankfully though, the rain never materialised and the ceremony continued uninterrupted, along with the marvellous reception that followed. The food again was excellent and the wine was never ending! 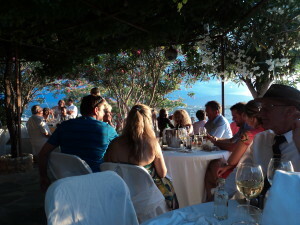 The sunset up there is magnificent and made all the more special for sharing it with friends, whilst eating, drinking and socialising. I knew most of the guests there and enjoyed plenty of dancing to many classic tunes, both from the live band and the DJ. What a brilliant weekend that was! All that eating, drinking and socialising and yet it didn’t cost me a penny! Gifts to both sets of newlyweds were of course – a Seashell Mosaic and Collage of their choice! Posing with Jeff & Shanna, the happy couple! Continuing our Sunday day trips, Nick and I visited Falasarna last week and Platanias this week. Oh how it’s fun to be a tourist every Sunday! On the way to Falasarna we pass through Kissamos, which is where the main port for boat trips to Gramvousa and Balos leave. We decided to stop for a big lunch in one of the Tavernas overlooking the sea and were amazed at how quiet it was there. There were very few tourists and Nick and I agreed that Kissamos definitely isn’t as nice a resort as Almyrida is. It’s too fragmented and spread about so that you have to keep getting lost in the quiet back streets to get to the main areas. 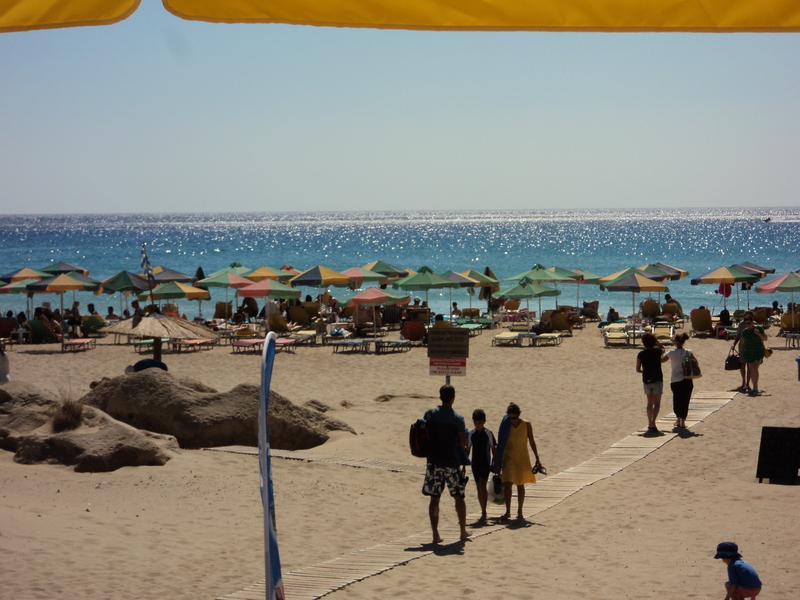 Nevertheless we had a good lunch and then headed for Falasarna beach. I have only ever been to Falasarna in the autumn and winter and really hoped it wouldn’t be too busy. The beach itself is fabulously sandy and stretches far and wide. It’s one of the best beaches for shells and I adore beachcombing when I have the place to myself! When the tourists are here – especially on a Sunday when the Greeks are out in force – it’s another matter! However we were pleasantly surprised to find that only certain parts of the beach had sun beds laid out and the rest of it was free for me to hunt seashells. I knew there wouldn’t be as many and the shells that were there were so randomly dispersed that I quickly tired of looking. It was a very hot day and the breeze was only fair, but the gusts were so strong that we got sandblasted a few times and that actually hurt! The sand was practically embedded into Nick’s back! Anyway, we later enjoyed a couple of beers at one of the beach bars before heading back to mine for a game of Canasta. Since Nick’s return to Crete I have been teaching him to play Canasta and of course, like everyone who learns the game – he is hooked! So this Sunday we decided to visit Platanias. This is a massive resort close to Chania and I admit I have never actually been there before, even though it is only about 45 minutes drive from home. We were up for a definite relaxing beach day and managed to find two very comfortable sun beds with padded cushions in a not too crowded area of the beach. We took a long stroll all the way along the lengthy strand, taking in all the beach-side restaurants and tavernas until we found one we liked the look of – especially one that made crepes! Here we had a snack lunch – I had two pancakes with sugar and lemon – a favourite of mine just lately and helping me gain the weight I wanted to put on! I took the playing cards with me so after lunch we played another game of Canasta on the sun beds. The little table under the parasol housed the pack and we laid out all our cards on our respective sun beds. It worked out fine and we had a great game where I won again! After our card game we went for a swim but it was more of a frolic in the waves! The sea crashing onto the shores of Platanias beach was hugely wavey and I went tumbling a few times, grazing my knees on the small stones that are mixed in with the sand! I must have looked hilarious as Nick laughed every time I got tangled in the waves, because he’d managed to stay clear of where the waves were breaking and I had drifted into them! Because we were only a few minute’s drive from Malame, we had planned all along, to go to The Black Lantern as its reputation for fine English food is almost legendary around our part of the island! We’d also decided we were going to have one of their classic Sunday roasts! Still on the coastal road just inside Malame, this unusual restaurant is decked out with human skulls of every kind you can imagine and other unusual artefacts. But the variety of the food available here is marvellous because it caters for all tastes, especially if you fancy a change from eating Greek food. Well it didn’t disappoint and it was the best English food I’ve tasted since Christmas and New Year! Back to the present and I have just had a nice long chat with my sister Karen and her family, who had all just returned from Hannah’s graduation. We were talking about Emma and Ash’s wedding and how Mark, Mike’s brother, wants to hire a very large villa in Almyrida to accommodate the whole of the Whelan clan! So I have been trying to source such a place and have come up with a couple of options so far, but will need to get more because there are so many people potentially coming to this wedding! I am now here on my balcony sofa, relaxing for half an hour while I drink in the fabulous view and atmosphere. Swallows and swifts are swooping back and forth and I can hear the cicadas. 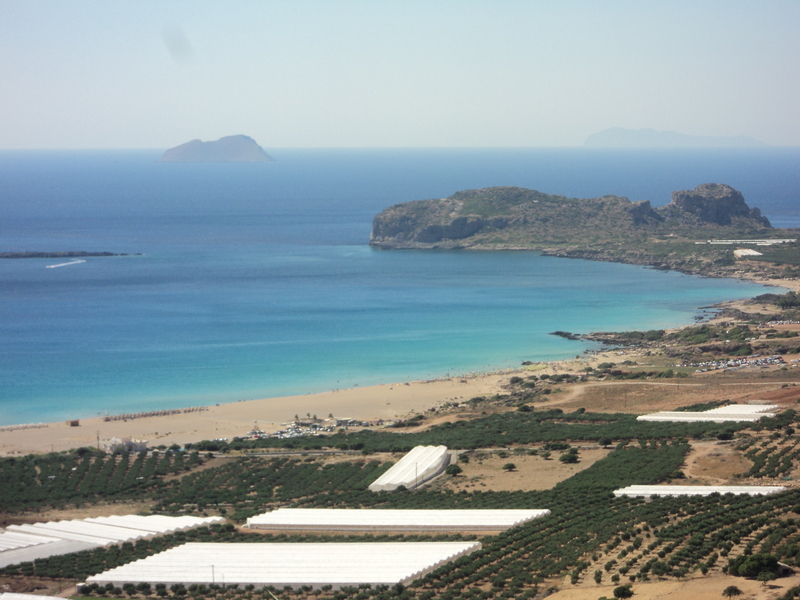 The sea is calm and a beautiful turquoise blue all around the edges of Almyrida Bay. I can even see Ian out by the island in his longboat with the distinctive red sails. Such beauty, peace and tranquillity is priceless.. yet I can have it all the time. Such is the rich quality of my life. This entry was posted in Blog Posts and tagged Almyrida, Plaka, Seashell Mosaics and Collages by micmaryjo. Bookmark the permalink.